in 1874, August Josef Corzelius married Thekla, the daughter of the potter, Johann Josef Gerhards, and subsequently in 1878, took over and renamed his father-in-law's factory at Bergstraße 4. August Josef Corzelius died here in 1901, but only after the death of Thekla Corzelius in 1909, did their second son, Carl Johann Corzelius take over his father’s factory. Carl Johann in the meantime had married Anna Schmidt. Their son Werner Karl (b.12/11/1911 - d.30/12/1988), took over the business from his father in 1945. Up until this point all their pottery had been produced using potters wheels and other traditional methods. But in 1950 they started to design and produce stone tableware, using modern slip moulding techniques. In 1954 the company's name was changed to "Werner Corzelius". In 1966, the company purchased some machinery, moulds & inventory from J.W.Remy. Again in 1971, they purchased some moulds from Eckhardt & Engler, (Werner Karl was a cousin of the Eckhardt's by marriage). In 1975 the company was inherited by Werner Karl's son, Paul-Werner Corzelius (b.1/8/1941), firstly trading as a Limited Company (G.m.b.H) and then as a sole trader (Einzelfirma). In 2003 the production facilities were leased to another potter. When the two year lease finished in 2005, all stoneware production ceased. Letter masthead, issued between 1909 &1945. August Josef Corzelius b.28/11/1836 - d.7/11/1901. Carl Johann Corzelius b.21/07/1875 - d.4/01/1949. Picture courtesy of Paul-Werner Corzelius, showing products relating to D.P. angem. 15090 / D.P. 1057482. Stein showing the inset, which together with its waterproof backdrop, forms the "stage". The "stage" consisting of the inset, together with the waterproof backdrop and the dancing figures, powered by a clockwork motor underneath. View from underneath the base, showing the clockwork motor installation. Impressed mark on Hofbräuhaus stein, dated 1984.
with finished product out front. Early production from Aug. Jos. Corzelius. A selection of the various products made by the original Aug. Jos. Corzelius company, prior to adopting modern moulding techniques. 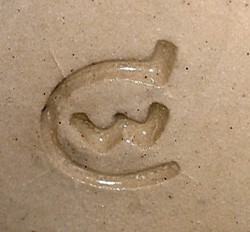 Original mould #425 was by Roßkopf & Gerz , which was purchased by Eckhardt & Engler and subsequently by Werner Corzelius. Therefore the example shown is dated, 1971 or later. Sticker on W. Corzelius #424 was originally owned by Roßkopf & Gerz , then Eckhardt & Engler and finally by Werner Corzelius. Therefore the example shown is dated, 1971 or later. Later combined maker's and capacity mark. probably the latter end of this date range. Thekla Corzelius b.2/10/1844 - d.23/1/1909. on 4 litre cider bowl. during period of 1954 - 1990. Impressed mark, dated 1954 onward. indicates this stein was made post 1990.